I had the pleasure to help Miss Amy decorate a 3-tier (well, actually 4-tier) cake she made for her brother's wedding rehearsal dinner. The baking aspect of this cake was a ton of work! Each tier consists of 3-layers. The decorating aspect was fun! I learned a lot about stacking multi-tiered cakes and coloring fondant. 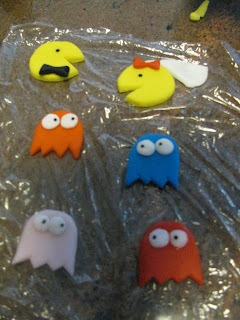 I also had a chance to play some more with fondant. Her wedding rehearsal follows a 80s theme, which sounds so fun! 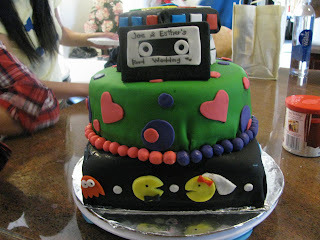 Not only is the wedding party decked out in their 80s gear, they will have a rad cake to add to the celebration! I am a bit sad that my camera was not able to capture how incredible this cake looks! Also, you can barely see the Rubric's cube in this picture. Look at all the details... this is the biggest creation for me! Everything on this cake is edible. Boy, what a learning experience!